‘the rich get rich and the poor get children’; Mmmm… sounds a bit like Karl Marx’s view of the proletariat — those lacking the ownership of the means production or distribution and only having their children (proles — Latin for children). Is this what Karl meant when he said the proletariat had nothing to loose but their chains? Unkind if true. Words by Gus Kahn and Raymond B. Egan, Music by Richard A. Whiting. Ev-ry morning, ev-ry evening, ain’t we got fun. Not much money, Oh but honey, ain’t we got fun. The rent’s unpaid dear, We haven’t a bus. But smiles are made dear, for people like us. In the winter, in the summer, ain’t we got fun. Times are rum and getting rummer, still we got fun. there nothing surer; the rich get rich and the poor get children. In the meantime, in between time, ain’t we got fun. Ev-ry morning, ev-ry evening ain’t we got fun. Twins and cares dear, come in pairs dear. Don’t we have fun. We’ve only started as mommer and pop. Landlord’s mad and getting madder, ain’t we got fun. Times are bad and getting badder, still we have fun. There’s nothing surer the rich get rich and the poor get laid off. The ukulele is said to have been originated by a Portuguese who landed in Hawaii some 50 years ago. The instrument from which is was patterned was more like the regular guitar called in Portuguese the taropatch, but being rather large and unhandy to carry about, this wise inventor studied out the present size and shape of the ukulele. After he had completed the first instrument, the inventor was at a loss for a name to fit it. While pondering over the question, a dog came along and, sitting on his haunches, raised his right hind leg and immediately began the rapid motion familiar to all of a real yellow dog scratching fleas from his body. Just at that moment, a native sat down and began to play the instrument. The inventor quickly noticed that similarity of the movements of the arm, hand and fingers as the strings were rapidly manipulated in extracting music. This action reaches its perfection in the hands of a real Hula Hula girl. The name ukulele flashed into the maker’s mind for that is the name of the jumping flea in PORTUGUESE. It’s nice get the facts from one who knows — so don’t just seat there, find someone who knows. Walter Shaner, who is said to have been sent away from the Redsox a few years back because he played a ukulele too much, will be with the Cincinnati Reds next summer. He’s an outfielder. On 10 November 1945, the Sydney Morning Herald told stories of inventive Australian soldiers who made instruments of necessity. For example, a digger at Milne Bay was heading back to camp on the back of a truck, holding his ‘splendid ukulele’. It fell from his hands onto the road, and the truck following ran over said uke, leaving nothing but splinters. To get by until a new instrument could be bought, he made a substitute from an empty emergency ration tin, a piece of bamboo and some left-over signal wire. The result, we are told, was a ‘fine’ instrument. There you go. A few bits and piece and Bob’s your parent’s sibling, a ukulele! A ukulele by Aloha Ukulele Manufacturing Co. The ukulele pictured below is one used by Stella Lamond. It has ‘Aloha Hawaii’ on the headstock with a coat of arms and a motto in Hawaiian. 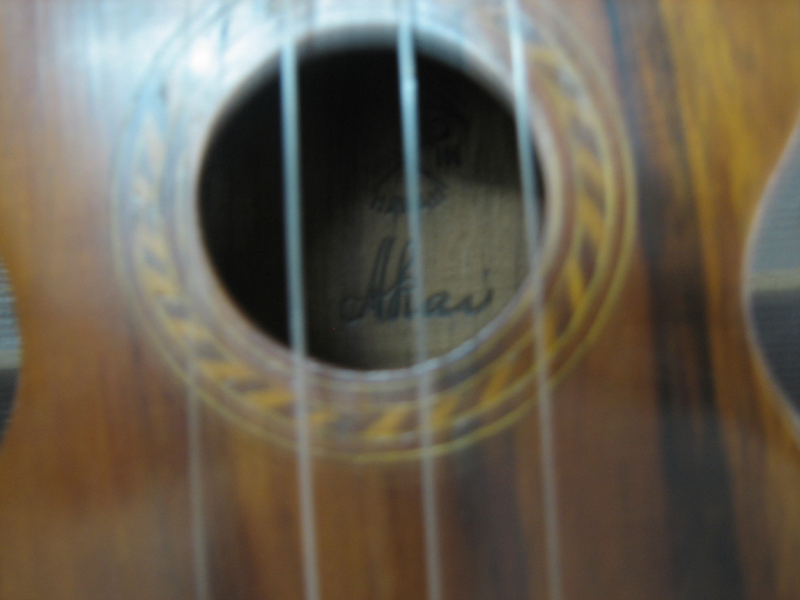 Inside the uke there are wood-burned words TABU-MADE IN HAWAII”; there is also the signature ‘AKAI’. And it has a snazzy case. Pictures by the kind permission of the Powerhouse Museum. The following account from the Ashburton Guardian, 4 August 1921, highlights the advantage of doing your research before making your investments. A curious story is being told just now of the horrible hiatus in a beach-comber’s repertory. The B.C. was in Hawaii, that land of dusky dancers. He saw a girl dancing to a most attractive air played on the ukelele, and so taken was he with it that he was convinced all the world would like it as well. So with the dusky maiden and a ukelele hied him to Broadway, New York, where on the first night after arrival he heard a gramophone give out the very tune on which he was staking his fortune. What, he asked, is that? Why, it’s the tune we’ve been jazzing to for months. Only then did he discover that the ukelele girl had caught the air from a passing liner. But you’ve got to admit, he knew a hit when he heard one. A poetic invitation and rhymed refusal were published together sometime after March 1917, and before the end of the First World War — the newspaper itself is as yet unidentifiable. We may have to serve the nation. Whom to believe? A ukulele controversy? The Pittsburgh Press in 1927 happily published contradictory views on the ukulele. The ukulele is really a Hawaiian instrument that was never meant for the jazz tunes that you hear played on it in this country. Nawahi played classical tunes and previously had won a Chicago Championship. It seems there was a little ukulele tribalism going on (and the uke can suit any tribe). 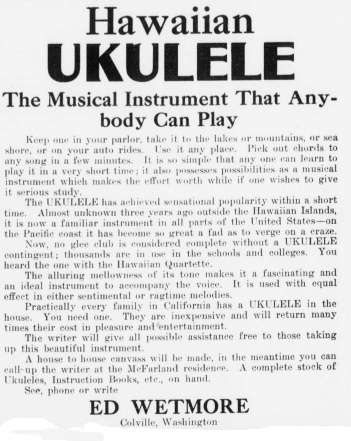 The Colville Examiner 5 August 1916 ran the following, aiming to strike the balance between selling a uke to anyone and warning that it might take a bit of work, really. 1. The ukulele has had a sudden rise in popularity. 2. A worthwhile instrument if you study it seriously. 3. There are thousands of ukuleles in schools. 6. The ukulele is cheap (compared to grand piano). 7. Seller has lots to get rid off, and is willing to help the beginner. So it was all there at the beginning of the craze. The ukulele meets Mills and Boon? I was listening sadly to the sound of moving in the room below. The room below. That had meant my sick man. The whimsical smile and the light in hollow eyes. The studio blurred before my vision. “May I come in?” It was my ever-present Scotch neighbour with his chirruping ways. “The Sara Lane is alone?” He settled himself on the couch with a ukulele. But I did not like the twang-twang tonight. I was not in the mood. Bobby MacAllistair threw down the ukulele. He walked over to me. He was sitting in a moment in his favourite attitude, at my feet. I felt something soft and heavy against my dress. But I did not notice. I put my hand down. It touched a thick head of shaggy hair. “Just leave it so a minute,” he said. I was lonely, too. I did. Then I felt flexible fingers steal up and hold mine. Hold mine with a warm throbbing clasp. “Sara,” he said again, “just once.” He was kneeling now. He tried to catch my hands. But I clasped them behind my back. A sudden resolve come to me. “All right,” I said. “I will. Then we’ll be engaged.” I am afraid my tone was business like…. There must be something else a body could do with one’s evening back in May 1918… Let’s see. I could have gone to the Church Historical Society’s meeting ‘at the Episcopal Divinity School’ to hear an address on “The Books and Writings of Bishop White” by the Rev. Lucian Moore Robinson, or there was the Vaudeville presented by the members of the 315th Infantry.